Jenn-Air Maytag Whirlpool Kenmore Stove Range 6 Chrome Burner Drip Pan 715877. Center hole measures 2 in diameter. Whirlpool Estate KitchenAid Roper Maytag Admiral Amana Speed Queen Jenn-Air Magic Chef Crosley Caloric Glenwood Hardwick Menumaster Modern Maid Montgomery Wards Norge JC Penney Wards Sears Kenmore. Drip pans have a purpose beyond looking attractive. Drip pans capture and reflect heat back to the coil which makes the burner work more efficiently. Drip pans also catch spills that otherwise would drip down into the internal workings of the stove and can prevent electric shock to the user. With regular use, drip pans do become discolored with time and may have to be replaced. Helpful Note: Aluminum foil is not a safe alternative for a drip pan. The heat beneath a range top element can reach upwards of 1000 degrees F which can ignite the aluminum foil, damage the range top and put you at risk for injury. 715877 Y715028 Y700440 715028 700440 7-15877 7-15028 7-0440 580036 5-80036 4381749. 22305 2300 2300ERS 2350EGS 2380EGS 2480 3860ERS 62942015 62942865 62942869 87899 87904 88890 89890 89890-C A100 A100-8 A100-C A100B A100B-8 A100B-C A100L A100L-C A100S-8 A100W A100W-8 A100W-C AC110B AC110B-8 AC110B14 AC110W14 C200 C201 C201-C C202 C202-C C203 C203-C C206 C206-C C206B C206B-C C206W C206W-C CAE1000ACB CAE1000ACE CDE820 CDE850 CDE851 CDE852 CU230 CUE840 CVE4180B CVE4180B-C CVE4180S CVE4180S-C CVE4180W CVE4180W-C JEA7000ADB JEA7000ADB13 JEA7000ADS JEA7000ADS13 JEA7000ADW JEA7000ADW13 JED8130ADB JED8130ADW R200 R201 R201-C RC8700EDB0 RC8700EDW0 RC8720EDB0 RC8720EDW0. Our mission is to become the #1 source for all your appliance part needs. Please review your order for accuracy before submitting it. The time frame depends on your location and is determined by the Post Office. You may go to their website and click "Calculate a Price" to determine if your package will take one or two days to deliver. Tracking information is accessible once the item is delivered to the post office or picked up by UPS. These charges are not refundable for all correctly filled orders. Please review the entire listing carefully and make certain you are ordering the part you need. Please note that appliance manufacturers frequently update their parts without warning. While we strive to update our listing pictures as quickly as possible, an outdated picture is not grounds for return. You must obtain a return authorization to return the part within this time frame. Parts are not eligible for return for any reason if we are not notified within the 14 day time frame. This is to insure that we can file a claim with the carrier when applicable. All items must be in a brand new (without signs of installation) and resaleable condition. All parts are inspected for signs of installation upon our receipt of them. In no way shall General Appliance Parts be liable for any loss, damage, fire, explosion, injury, including any incidental or consequential damages, or death as a result of ordering and/or installing any parts from our website or from the results of any action taken due to reading information found on our website. The information is provided as a courtesy to our customers to enhance their understanding of their appliances, it is not to be taken for instructional purposes on how to repair their system. General Appliance Parts suggests having all parts, accessories and equipment installed by a qualified heating and air conditioning technician. If a customer attempts to install a part, accessory or equipment, he or she should have a thorough understanding of electricity, reading wiring diagrams and the work to be performed. In no way shall General Appliance Parts be liable for any loss, damage, injury, including any incidental or consequential damages, or death as a result of ordering and/or installing any parts from our website or from the results of any action due to reading information found on our website. 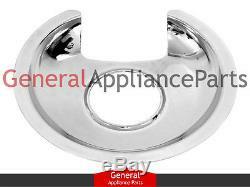 The item "Jenn-Air Maytag Whirlpool Kenmore Stove Range 6 Chrome Burner Drip Pan 715877" is in sale since Thursday, May 17, 2012. This item is in the category "Home & Garden\Major Appliances\Ranges & Cooking Appliances\Parts & Accessories". The seller is "generalapplianceparts" and is located in Louisville, Kentucky. This item can be shipped worldwide.